On April 2nd, Lugia returned to the sea and the Eon Twins, Latios and Latias, made their debut in Pokemon GO! Like the Legendary Beasts, these two raid bosses are regionally based, with Latios in North America, South America, and Africa, and Latias in Europe, Asia, and Australia. On May 8th they will swap locations, and on June 5th they will fly away from the raid scene altogether. 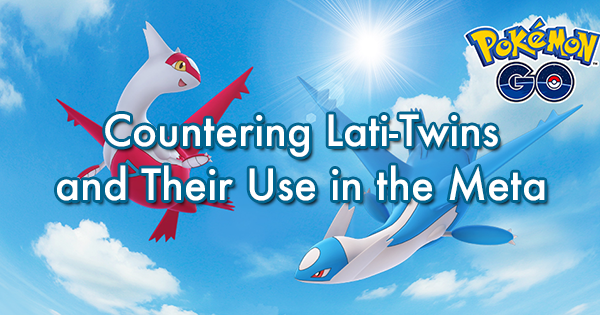 With stats comparable to the Big 3 Dragons (Rayquaza, Dragonite, and Salamence) and a Psychic sub-typing giving them a unique set of resistances, the Lati-twins seem like they could be decent additions to anyone’s team. Additionally, Latios has access to the coveted charge move Dragon Claw. Naturally, trainers have been asking how to conquer these dragons and their use as attackers. Using our best mathematical understanding of raid AI, simulated matchup data, and real-world analysis, we here at GamePress believe we have the answers players are looking for! Dragon Breath is preferred over Zen Headbutt for yielding higher cycle DPS and having better neutral coverage. Dragon Claw is the ideal charge move. As a 3-bar move with short duration, it makes Latios a highly efficient low-motivation gym sweeper. Solar Beam is a powerful move that is superior to Psychic in neutral matchups. That said, Psychic has synergy with Zen Headbutt and makes Latios a good Psychic attacker against targets weak to Psychic, such as Machamp. Dragon Breath should be paired with Outrage. This is Latias’s generalist set and performs better than Thunder against most Water and Flying-type Pokemon. Zen Headbutt should be paired with Psychic. This set has advantages over Fighting and Poison-type Pokemon. Thunder is a sub-par move. TM this move. The Eon Twins are Dragon / Psychic-type Pokemon with nearly identical movesets, giving them near identical counters. The greatest counters for all of their movesets are the Big 3 Dragons, Rayquaza, Dragonite, and Salamence, with any of their double Dragon movesets. These dragons are especially good against Solar Beam Latios, as they have double resistance to Grass. These resistances allow them to reliably dodge 2 Solar Beams before entering "death-loop" glitch range at even modest levels. Tyranitar is an exceptionally tanky option against Psychic and may give players some comfort against Dragon Claw and Outrage movesets, but has to be wary against Solar Beam. Mewtwo is an excellent all-rounder with Shadow Ball, and if this isn’t your first rodeo, Latios and Latias both make decent counters with their Dragon-type movesets as well (but are notably worse than the “Big 3”). If you’re looking to save on revives against Dragon Claw and Outrage movesets, and/or if it’s cloudy outside, both Granbull and Gardevoir are excellent tanky options with their double resistance to Dragon. Against Thunder Latias, Groudon establishes red supremacy with Dragon Tail and Earthquake. If potions and revives aren’t a concern of yours, Gengar is a great glass cannon but has less impressive DPS compared to the Big 3 Dragon-type Pokemon. If you lack the aforementioned Pokemon, Mew, Scizor, and Articuno can fill gaps in your teams nicely. When using Mew, Shadow Claw and Dragon Tail pair well with Dazzling Gleam, Blizzard, Ice Beam, Dragon Claw, and Dark Pulse. If you’re looking for more counters, Gyarados, Pinsir, Jynx, and Houndoom are decent substitutes. Other Ice-type Pokemon aren’t terrible picks, but they’re far less useful for this raid than they were against Rayquaza since the Lati-twins are only weak to Ice-types instead of doubly weak to them. Overall, the battles shouldn’t be too difficult and can be easily conquered by 7 or more trainers (or just 3 with optimal teams). It’s not mandatory to hit these breakpoints or bulkpoints, but they are the levels where your attackers will have a noticeable improvement in their performance. If you are unfamiliar with what a breakpoint or bulkpoint is, we suggest checking out our guides on breakpoints and bulkpoints. If you’re curious about the breakpoints of other Pokemon or fast moves, you can find them using our breakpoint tool. You can find your Pokemon’s unique bulkpoints using our bulkpoint tool as well. While the Eon Twins are powerful Dragon / Psychic-type Pokemon, both face stiff competition from more powerful Dragon and Psychic-type Pokemon. Overall, they make decent alternatives to Rayquaza, Dragonite, Salamence, Mewtwo, and Lugia, but don’t hold enough advantages to be worth powering up in their stead. While Solar Beam has allowed Groudon and Ho-Oh to encroach on Grass supremacy, Latios’s Solar Beam isn’t as threatening. Latias’s Thunder performs worse against Water and Flying-types compared to Outrage, and neither give her a niche advantage over Electric-type attackers. One novelty Latios has over the others is being a powerful Dragon-type Pokemon with access to Dragon Claw, which allows him to be a swift gym cleaner. In addition, having a Psychic typing allows him to resist the most powerful fast moves on gym defense, Confusion and Volt Switch, when Dragonite and Rayquaza are hit for neutral damage. While these advantages aren’t enough to make Latios an MVP Dragon-type Pokemon, some players may enjoy the experience (namely those without Dragon Claw Dragonite). When considering combat, The Eon Duo aren't the twins you're looking for. While Latios has some gym utility, they both are lower on the list of recommended Dragon-types. These bosses will be available for about a month per region, so there are a lot of opportunities to fill your box with them. A maxed out Latios is attainable for anybody who might lack in Salamence, Rayquaza, and Dragonite. He has the stats to be relevant, so trainers will be sure to find some niches for him to fill. Also, their availability helps out recently released Research Tasks that involve catching Dragon-types. With such a long period between raid rotations, it is feasible that Niantic will do another "Legendary Week" that will dilute the tier 5 boss pool. So, catch some Lati-twins while they're the only Tier 5s in town.